Six bucks a night. That’s cheaper than the rent when landing on Baltic Avenue on a monopoly game. 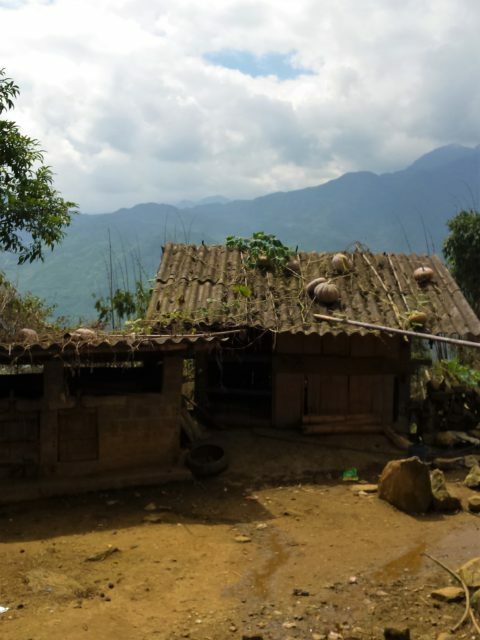 That’s Sapa, Vietnam. A quick trip on a night train plus a two dollar bus ride up the mountain and BAM!, you’ll find yourself in the pages of a National Geographic magazine. The hills are full of surprises, possibly a few landmines left over from the war so you want to be careful and have a guide. The above photo is Sue, from the Red Zhou tribe. She is 34 years old and with a face made for Oil of Olay. She looks like she had a face lift, as do many Vietnamese women, her skin resembling a baby’s behind instead of a sun drenched raisin like mine. Sue approached me in the town square to go on a hike with her. I couldn’t resist her smile or glimmering gold tooth. (Hikes from locals are cheaper than those purchased through a tour agency, yet are more treacherous, meaning, if you twist your ankle on a slippery clay path like this one, you’re screwed). 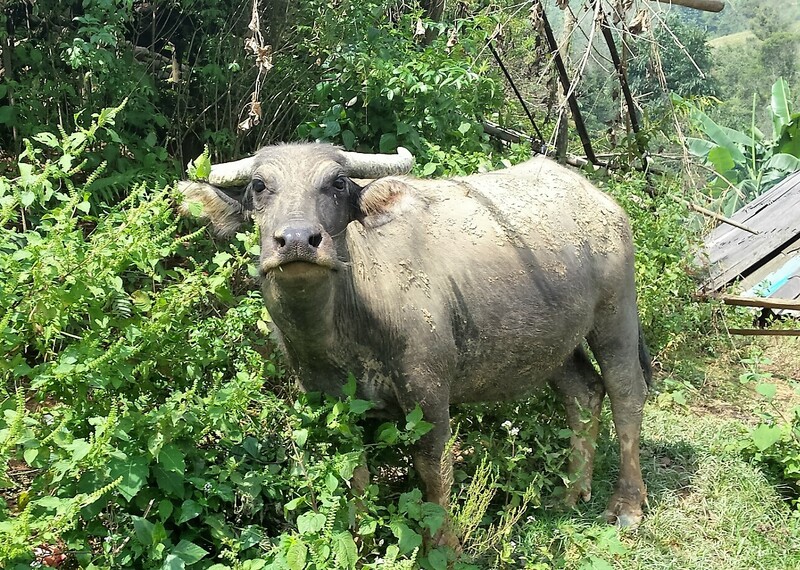 I filled my water bottle, tightened my shoe laces then trespassed with Sue thru rice patties and pastures, where I had a stare down with this buffalo. 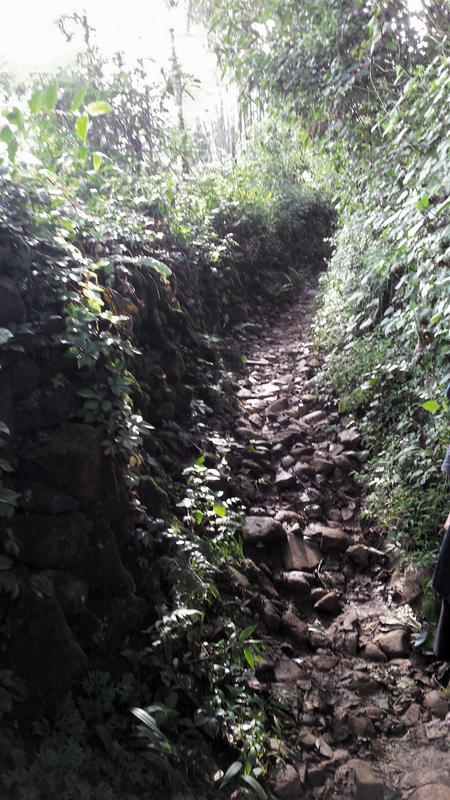 We hopped on stone paths across streams. It reminding me of sneaking into the back of movie theaters as a kid. Tour agencies through local villages will bring you through the front of the village and you will have to pay admission. The trek was quite a workout, well, at least for me. I was wearing my trusted hiking boots while Sue was prancing in plastic flip flops. Bad flip flops without Dr. Scholl’s Gel Insoles. And so were two young guys that zoomed passed us, each schlepping 40 kilos of rice on the their backs. Dang. 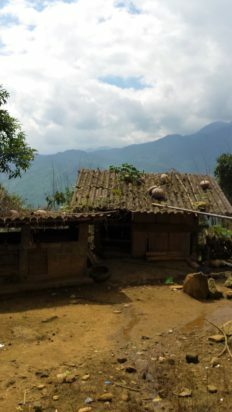 If rice hauling up a mountain was an Olympic event, Vietnam would own the gold. 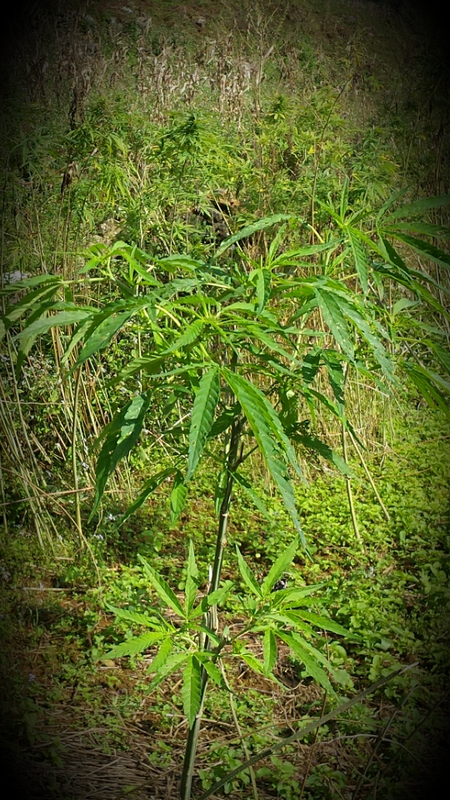 When not giving tours, Sue and other village woman make weave material out of this plant. The hemp material is dyed with the local indigo plant. The women hand stitch designs on their outfits which could take up to a year. Sue spends her days mingling with tourists for personal tours or selling crafts while her husband tends to the pigs and pumpkins. She loves her village home, even though it would never make in on International House Hunters. And like many village women, Sue had an arranged marriage. Her husband gave her a bracelet instead of a wedding band. I asked her if she was happy. Sue just smiled. But what does she have to compare it to? She has never seen Oprah or Dr. Phil. She has never received a dozen roses at work. She has never received a love note in her lunch basket because most villagers are illiterate. But Sue boasts that her children have the luxury of going to school. 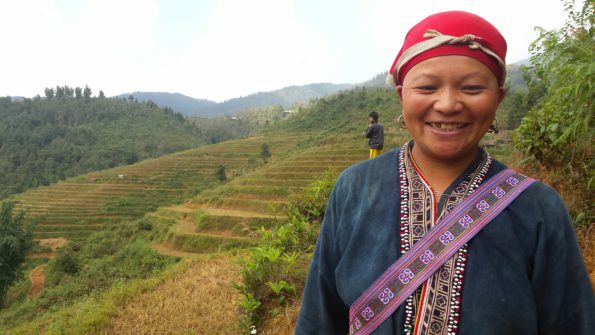 Tourists come to Sapa to snap photos of women like Sue but the Vietnamese locals despise them, considering them “tour whores”. 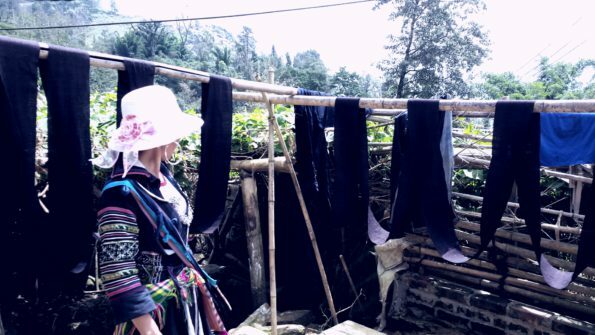 Yet, these women bring the color and culture to Sapa. Plus, one more important thing: the tourists. *Don”t expect a home-stay experience in a Vietnamese to be like the quaint places that serve home made cinnamon rolls on the shores of lake Michigan. No electricity, water, toilets, or duh, wifi. Imagine the fort you made out of scrap wood in your back yard as a kid with a rooster for an alarm clock, and the smell of buffalo droppings instead of a Glade Plug In. That’s what it will be like. But hey, you can always clean up at your hotel in Sapa. My hotel of choice? The Sapa Rose.